My cute hubby, Mikie, needed a treat for his work luncheon the other day. I love when he needs a treat because it gives me a chance to try something new. the problem is that he has an hour commute to work and he rides the train. As we were going through options, he kept coming up with reasons that it wouldn’t work on the train. Finally, we decided to make some gourmet popcorn. It’s easy to carry and not so fragile that you are afraid it won’t make it to where you need to go. 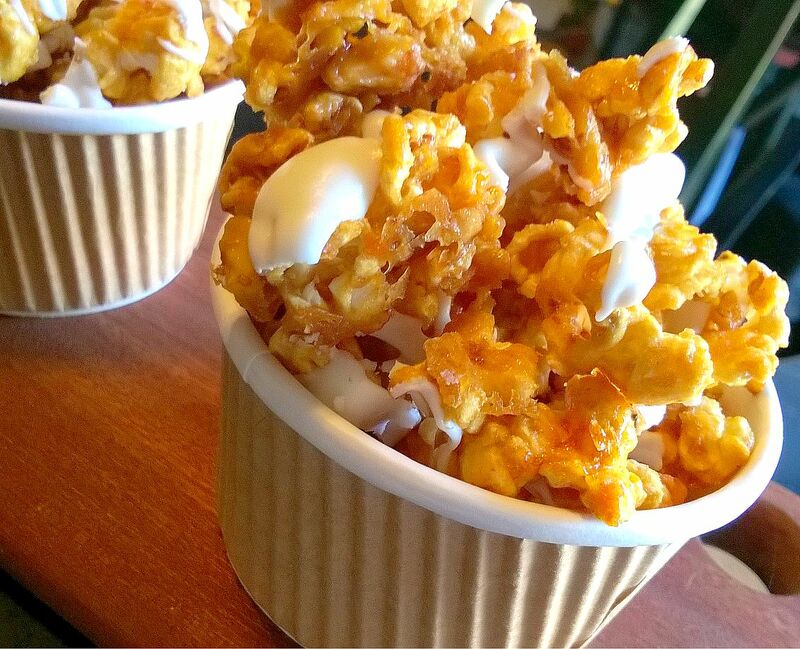 Seriously, it’s amazing how simple popcorn can be transformed into something so divine! The great thing is that it’s fabulous for any occasion. Tonight, my Andie’s will be cheering at her first football game of the season and I think I might make a batch to share with the crowd! Warning! You will not be able to stop eating this popcorn, once you get started! Pour popcorn in a large bowl with the almonds and set aside. In a large pan, melt the butter on a medium heat. Add the brown sugar, cinnamon, and corn syrup, and combine by stirring constantly. Continue until the sugar has dissolved completely. This will take a few minutes. Remove pan from heat and add the vanilla and the baking soda. Stir to mix well. The baking soda will make the mixture expand. Pour caramel mixture over the popcorn and toss to coat well. Spread popcorn evenly onto 2 baking sheets that are covered with parchment paper. Bake each pan, individually for 30 minutes, stirring every 10 minutes. Remove the pan from the oven and place the parchment paper with the popcorn still on, onto to the counter top. I placed a couple of new pieces of parchment paper out so I could spread the popcorn out even more. Melt the almond bark according to the package instructions. 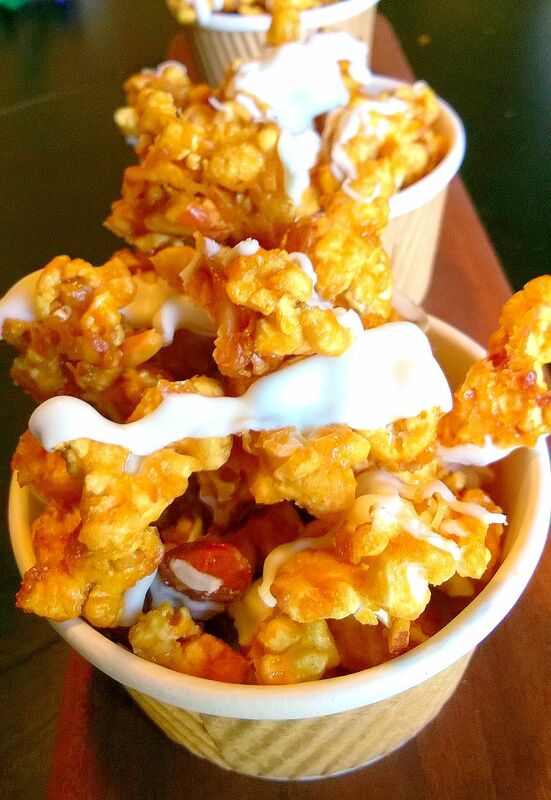 Drizzle it over the popcorn. It was easier for me to use a wooden spoon to drizzle the almond bark. Let cool until everything is set and hardened. Then break the popcorn apart and enjoy! You had me at almond bark! Yummy! Pinned. Kimberly, that looks amazing! Definitely going to pin for later! I would love to see you swing by tonight @ 8pm for This Momma's Meandering Mondays! I will see you again tomorrow night! Oh yum! We love fun popcorn recipes and will have to try this one! I'll bet it was a hit! this looks amazing, thanks for linking up! Oh my this looks wonderful. I have a kids birthday party to cook for next week and this would be perfect! Please consider sharing it with my readers, I think they need to see it! 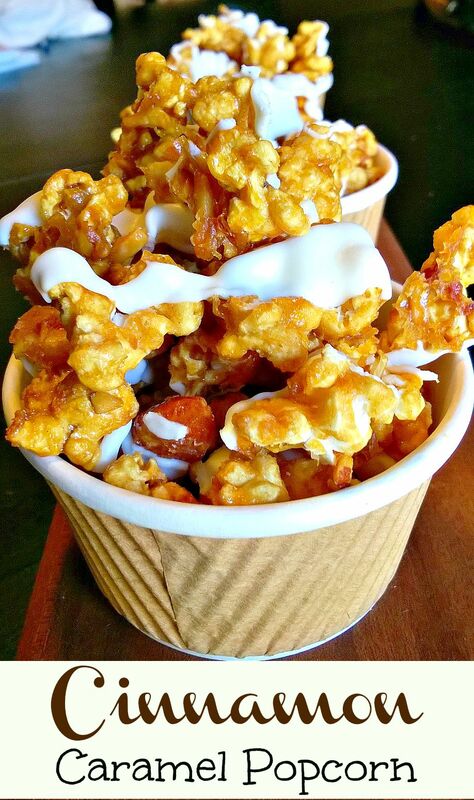 Delicious Cinnamon caramel popcorn, thanks for sharing with Hearth and soul blog hop, pinning. That's popcorn I'd actually eat! Yes, I'm weird I know for not loving popcorn. 😉 Thanks for linking up to this week's Tasty Tuesday! I've pinned it to the Tasty Tuesday Pinterest board! I hope you'll link up again this week. Oh My I love popcorn!! This looks amazing!! Thanks for sharing on My 2 Favorite Things on Thursday! Hope to see you again this week!! Pinned!